Another 161 Nigerians return from Libya – Royal Times of Nigeria. 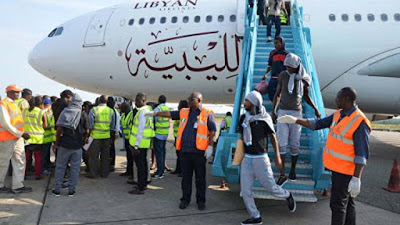 Another batch of 161 Nigerians in Libya were yesterday repatriated back to the country courtesy of the assistance of the International Organisation for Migration (IOM) and European Union. Southwest Zonal Coordinator of the National Emergency Management Agency (NEMA), Suleiman Yakubu, who represented the Director General, Mustapha Maihajja, received the returnees on behalf of Federal Government. Among the returnees are 78 female adults and two female infants, while males are 71 adults, five children and five male infants made up the total of 161 returnees that include two medical cases.